What could be easier than olives and cheese-stuffed peppers that you picked up at the shops on the way home? I particularly like the colour contrast of these two. Oh and the taste. You can’t go wrong with the lemony-buttery taste of Nocellara olive flesh, while the soft creamy cheese paired very indulgently with the sweet piccante crunch of the pepper. This one was also a little bit last minute. 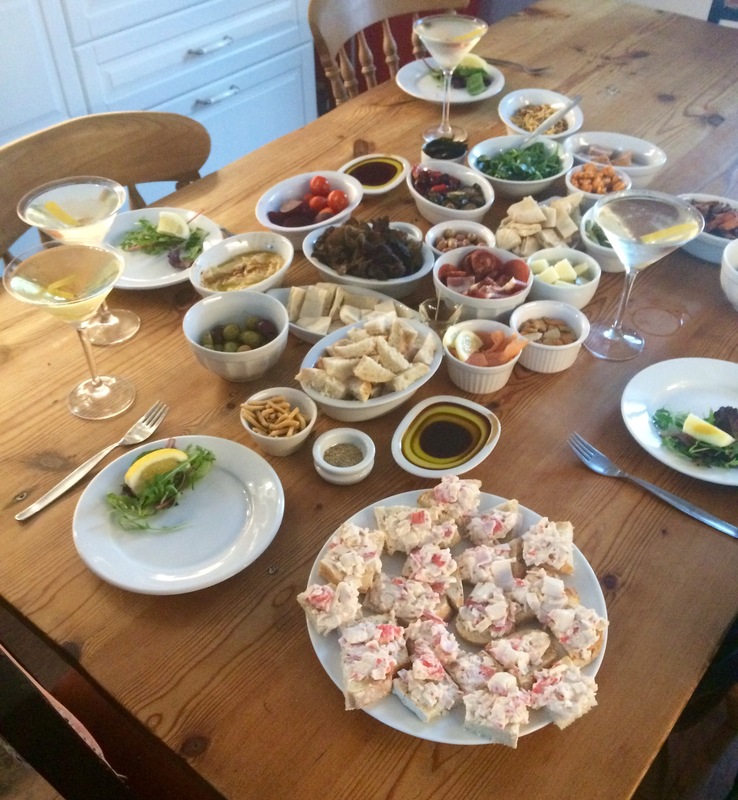 I threw together some Bombay mix, prosciutto and olives when a friend popped round unexpectedly. The Bombay mix didn’t really go with the other two, but it’s definitely very nice on its own. Here are some nuts, arranged mindlessly while I stared into space sipping my first drink of the night. Salted pistachio nuts are my favourite, although some nice big fat macadamia nuts would go well with a martini too. 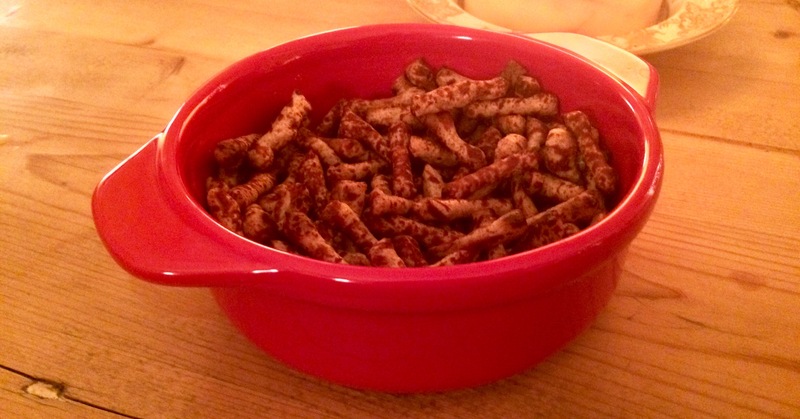 Simple, easy, light, savoury, Twiglets are an underrated canapé snack. They are the flavour and texture opposite of the martini. 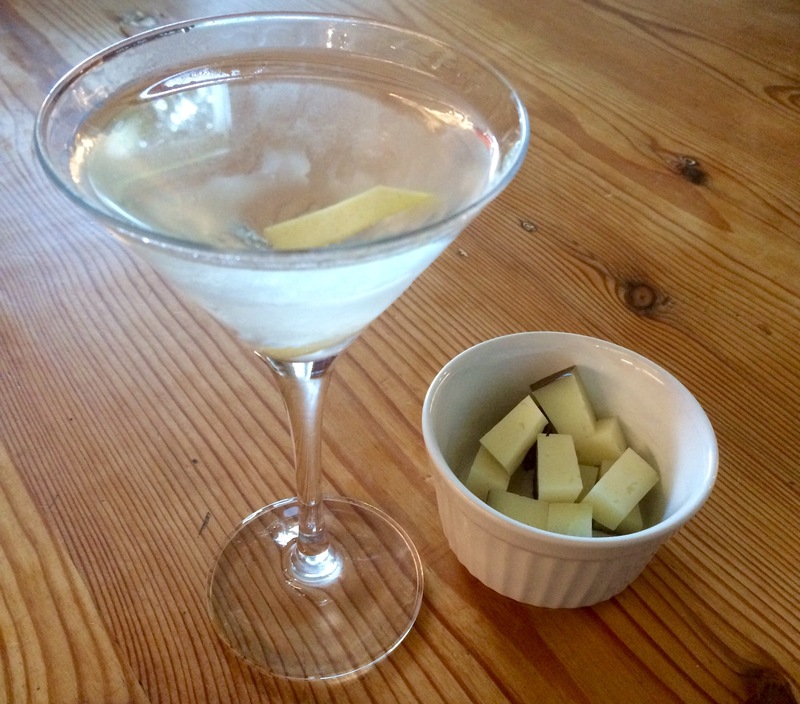 Where a martini is cold, smooth, heady, citrusy and ever so slightly sweet, these are light, crunchy, salty and savoury. They don’t look particularly elegant but the flavour contrast really works. They’re a guaranteed winner for marmite fans. A simple but slightly more edgy snack, here are some wasabi peas with a simple classic. 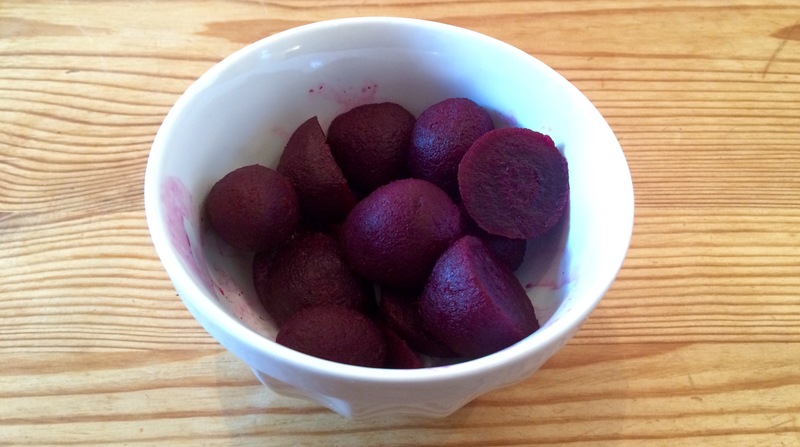 Extremely simple, but very tasty, here is some lightly pickled baby beetroot. I’m sure we could create some kind of pink-coloured beetroot Gibson Martini, perhaps similar to the Beet Up Vesper Martini at the Mayor of Scaredy Cat Town bar in central London. 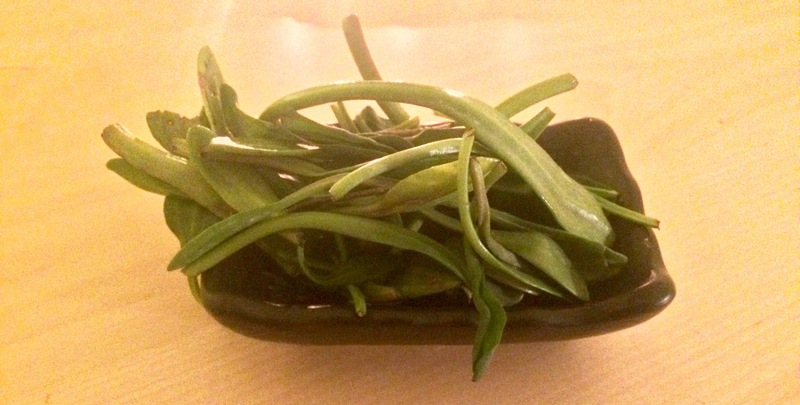 Sea Aster is a seasonal coastal plant that flowers in the summer but is edible in the spring. 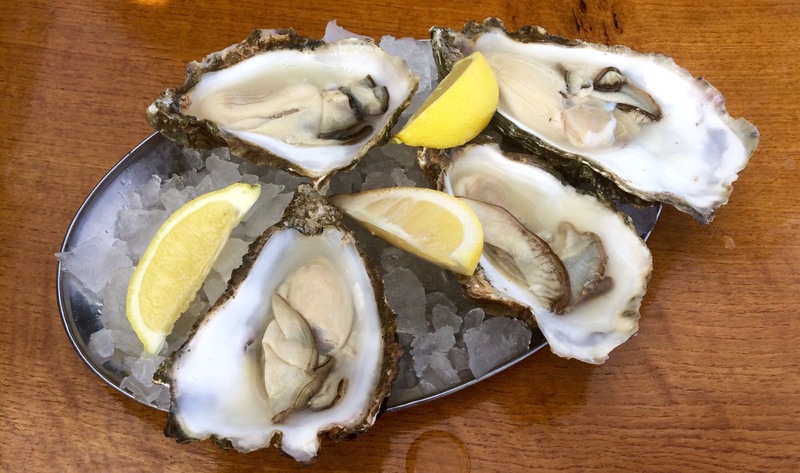 Wash and eat raw or lightly boil for a minute or two. I got mine at a fish monger’s in Borough Market. 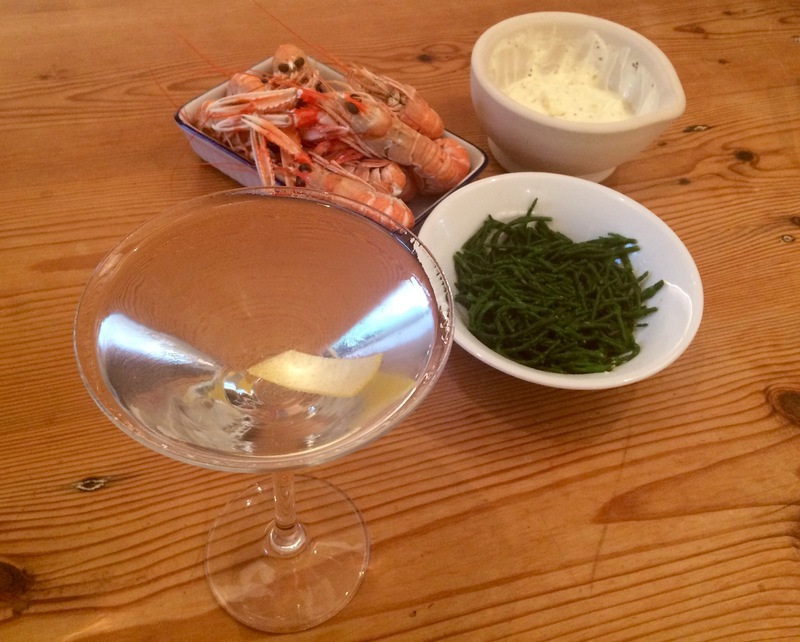 Mum bought these langoustines from Tobermory Main Street while I picked up the samphire on Oban pier on a trip back from London. There’s a whole world of tapas-style ingredients and food types you could use. Above you can see chorizo, cold roast pork slices, feta cheese, olives, bread, houmous, oil and duqqah. 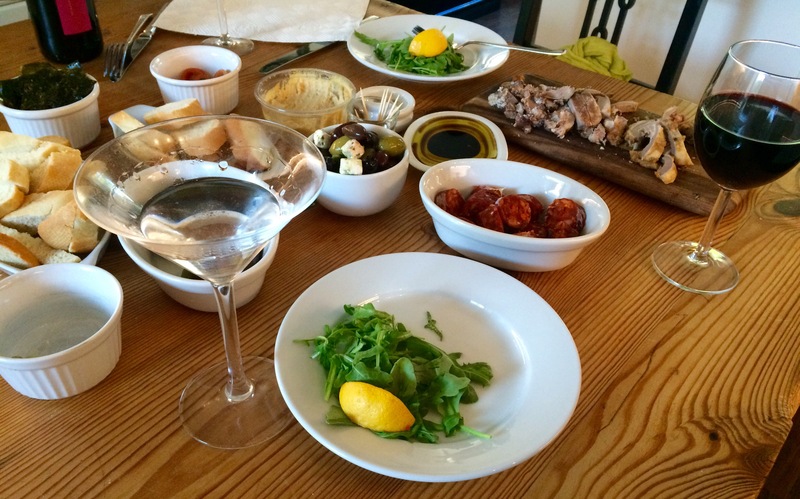 You can turn the nibbles into your whole meal and really take your time with the martini. Above you can see crab open sandwiches, nuts, wood ear mushrooms, Korean-style spinach, roasted vegetables, seaweed, manchego cheese, Bombay mix, olives, bread, oil and houmous all to be slowly munched while you sip your cold gin. 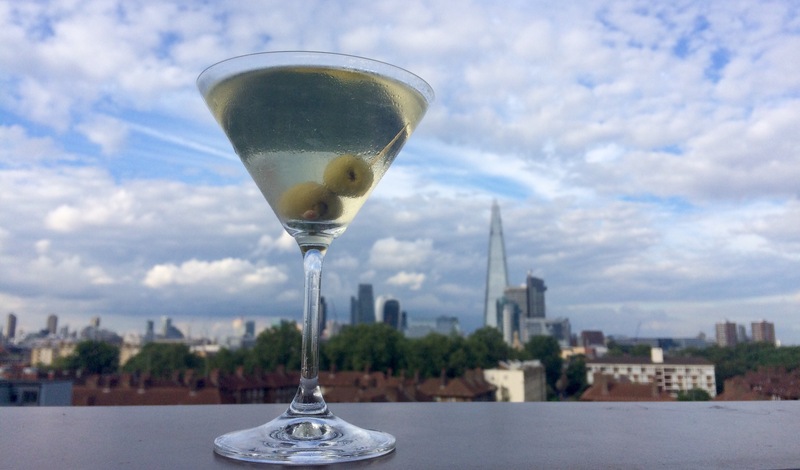 Houmous is a relaxed martini accompaniment to have at home with informal company over a drink. 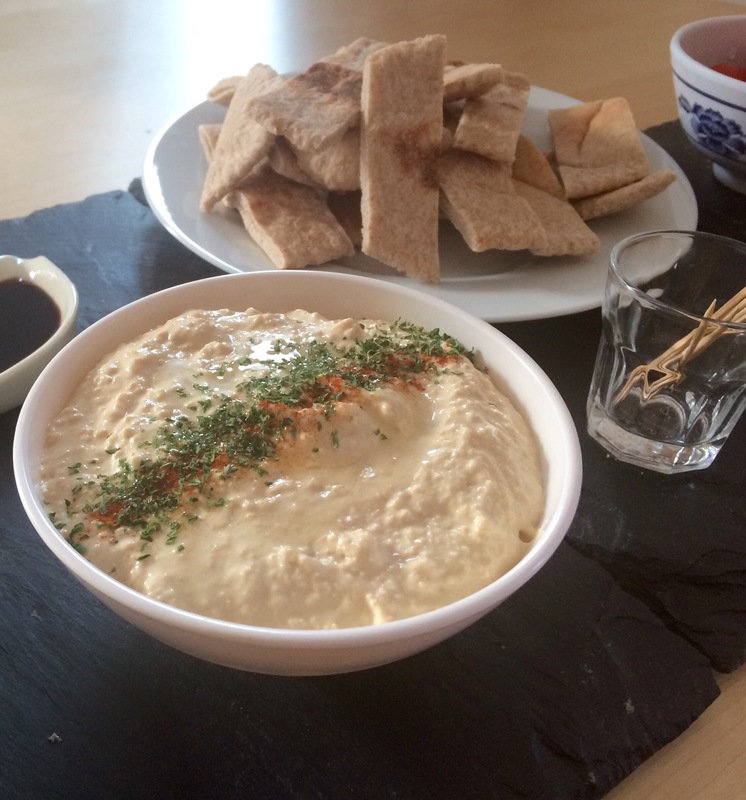 Here it is served with sliced pitta bread and a variety of mostly Mediterranean snacks. 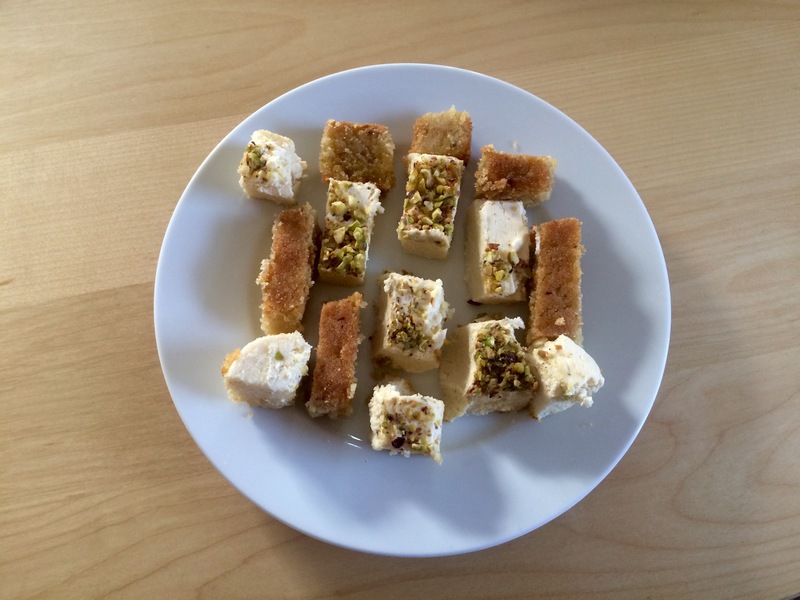 My kind neighbour made me some lovely Middle Eastern sweets which I included in the meal. The Arabic element of the food was especially good at soaking up some of the alcohol! 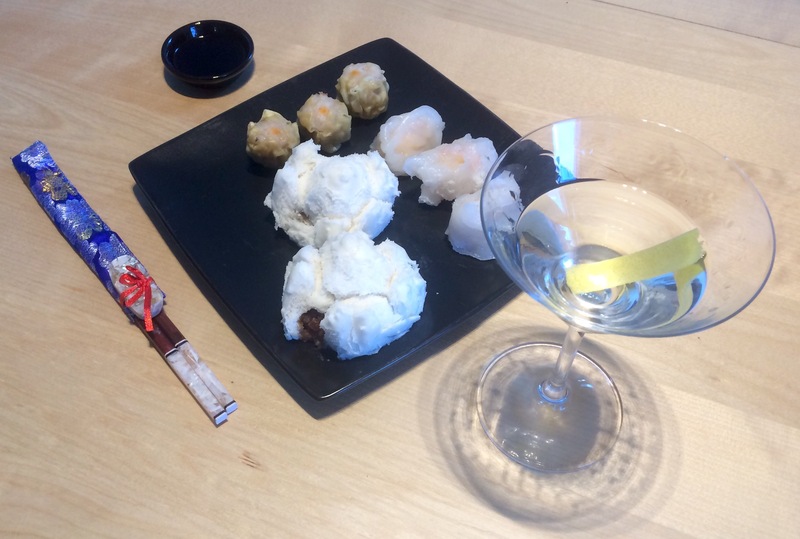 Dim sum was a surprisingly good – if slightly unconventional accompaniment. I also love creamy manchego cheese. 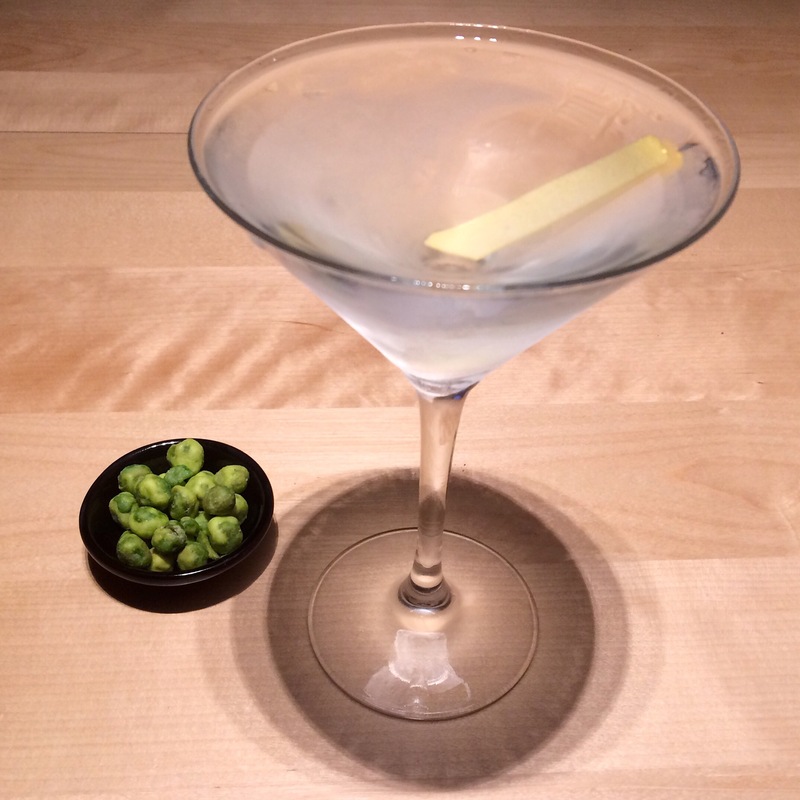 Finally though, the most classical martini snack will always remain the pitted green olive. If it’s all you have, you’ll be fine. And you won’t spoil your appetite for dinner.